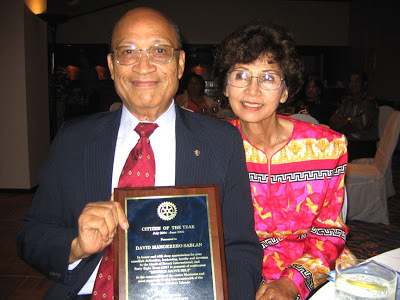 In 2005, Sablan, who turns 87 in early April and founded Saipan’s Rotary Club in 1968, was named Rotary Club Citizen of the Year, the first time in the club’s 37-year history the club presented this award to one of its own. David M. Sablan and his wife. Rita, on July 3, 2005, when, for the first time in the Saipan Rotary Club’s 37-year history, the Rotary Club of Saipan presented its Citizen of the Year award to one of its own. I have the photo of Mr. Jose Sadao Tomokane. He told his wife one day the reason for coming home late. He attended the cremation of the American woman pilot. Mrs. Tomokane and Mrs. Rufina C. Reyes were neighbors during the Japanese time. They often visited with one another. Dolores, daughter of Mrs. Rufina C. Reyes, heard their conversation about the cremation of an American woman pilot. These two wives were the only individuals who knew secretly about the cremation of Amelia through Mr. Tomokane. 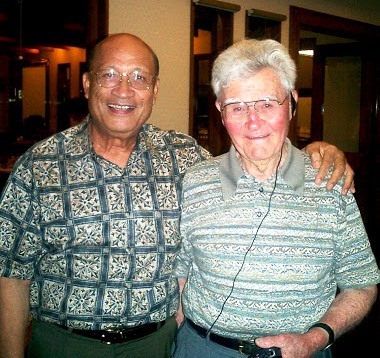 David Sablan and Maj Gen. Paul Tibbits, the pilot of the famous Enola Gay, the B-29 Superfortress that dropped the atomic bomb in Hiroshima in August 1945, circa June 2004. Gen. Tibbits revisited Saipan on the 60th Anniversary of the Invasion of Saipan, June 15, 1944. Going back in years, during the Japanese occupation of Saipan (late thirties to early forties), I was wandering around the northern part of Garapan Town, when I saw a large crowd gathered near the dock area of a large Japanese company, Nanyo Boeki Kaisha (or NAMBO). This dock was privately owned by NAMBO for unloading cargoes that were brought in by “sampan” or barge unloaded from a ship into a sampan and brought ashore by a barge to the small “jetty.” I was curious to see what was going on but I could only see a plane which was apparently off-loaded from a barge at the NAMBO dock. I saw an airplane being towed on Second Street in Garapan Town. The plane was being towed southward on Garapan Main Street. I later learned that the towed airplane was seen at “ASLITO AIRFIELD” on the southern end of Saipan. A local worker at Aslito Airfield came by our ranch in Chalan Kiya and told us that the airplane was recovered by the Japanese as well as a woman and a man pilots. The name of the person who told us is ISIDRO LISAMA. Sablan then recalled visiting the Marshall Islands during the course of his many duties with Atkins Kroll Guam Ltd., where he rose from being traffic clerk to president and general manager, and upon his retirement, as chairman of the company. “One person that I remember very distinctly is Bilimon Amaron . . . was one of my customers for the merchandise that we used to sell. And I said, ‘What do you know about Amelia Earhart?’ Well, [he said] I was a corpsman in 1937 working for the Japanese government and all of a sudden we were asked to go on a ship to treat a man and a woman who were injured and were on that ship . . . and [he was told] you are not to say anything of what you see. This is in 1937. David Sablan’s childhood memory is valuable in that we have scant witness testimony about the disposition of Amelia Earhart’s Electra, and how it came to be at Aslito Field when it was discovered in a hangar there during the American invasion in the summer of 1944. And although many have heard and written about Bilimon Amaron’s sighting of Earhart and Fred Noonan aboard a Japanese ship at Jaluit in summer 1937, as a prominent member of the Saipan establishment, Sablan’s endorsement of Amaron’s eyewitness account lends it additional credibility and weight. Considering that the popular sentiment on Saipan against the proposed Amelia Earhart Memorial Monument remains strongly against its success, Sablan’s accounts can only help this worthy cause. 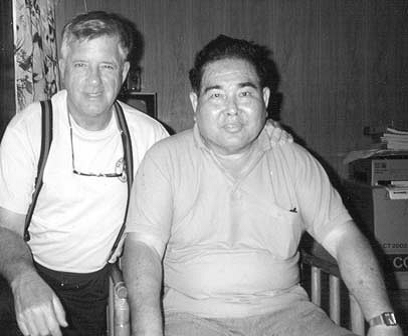 Sablan also has several interesting photos on his blog, including one of his meeting the emperor of Japan. To see these, please click here. Your support of the Amelia Earhart Memorial Monument would be greatly appreciated; please see this blog’s front page, top right side for more information. Despite being only five years of age at the time, the incredible sight of a large, shiny, twin-engine aircraft being towed through the streets of Garapan Town, Saipan would be something so utterly fantastic to a small child (as well as many adults) in that place, and at that time as to make an indelible impression in the mind. I believe David Sablan’s testimony. It is a very credible and valuable piece of key evidence. We are very fortunate indeed that it is recorded and documented for all time. Mike- if in fact she was cremated, who did Griswold and company dig up on Saipan? Very simply, we just don’t know all the facts about AE’s death. Marie Castro is certain that she was cremated, via testimony from Matilde Arriola, Joaquina Cabrera and Jose Tomokane, which seems credible and believable. Griswold, Henson and Burks dug up to skeletonized individuals that Griswold apparently thought were the fliers. He was quite vehement in telling the Marines not to say a word about it, and never admitted to his role to his grave. Michiko Sugita told Tom Devine the American woman pilot was executed, per the Saipan policemen who told her that as a 12-year-old. Others heard different stories, and of course Nievas Cabrera Blas said she saw a white woman shot in 1944 and buried in the spot where Buddy Brennan produced the “blindfold” he claimed she wore. Those are just the main stories, others have told researchers various versions of similar deaths. I agree “we just don’t know all the facts about AE’s death,” but I find it difficult to believe any Chamorro would have witnessed a cremation conducted by the Japanese. It’s just not plausible. I give credence to Anna Magofna’s grave site encounter. Taking into account the inquiries of Goerner and Devine, the Mroz statement, Griswold, Burks, & Henson’s digging detail, and the Army JAG report, we have a complete chronological accounting of the events leading up to Earhart and Noonan’s burial outside the northeast corner of Liyang Cemetery. Although Marie Castro is a fine woman, she makes no mention in her self-published book “Without a Penny in My Pocket” of the Tomokane story. Nor did she cite Dave Sablan. Dave told me many times his recollection as a four year old of seeing an aircraft being carted over the streets of Garapan. That story seems plausible. Yet, to my knowledge, Dave’s account has never been corroborated by other Earhart witnesses. That seems strange considering the thousands of people living in and around Garapan at that time. The Tomokane story seems like an embellished tale. “A spy plane,” the lady answered. “it is a woman pilot,” another added. Thanks Les, I too give credence to Anna Magofna’s childhood memory as told to Don Kothera and the Cleveland Group, just forgot to include it in my response to Dave K. You make good points, certainly. Good arguments for a cremation are the accounts of Matilde Arriola and Joaquina Cabrera, who were told the white woman died of dysentery by the Japanese. From there, cremation is the usual procedure for dealing with the body. And of course we have the other scenario, with burial of the bodies, as Anna recalled, as well as several others who heard that version from Japanese soldiers, such as Jose Pangelinan. What is the discerning person to think? I myself have asked Marie how the people on the ground knew the plane was a “spy plane,” in our correspondence, or how they knew the pilot was a woman. A 4-year-old’s memory is just not that accurate for details such as these. Marie herself admitted that she wasn’t real clear on all these details, and of course we have a slightly different narrative from the other eyewitnesses including Josephine about the arrival of the fliers at Tanapag. Marie has just sent me an email in which she repeated that Jose Tomokane was not Chamorro, but Japanese. I should add that whatever “embellishment” this story may contain didn’t come from Marie. Her book was not at all focused on the Earhart disappearance, and she wrote only a few pages about what she knew as a first-person interviewer of Matilde and Joaquina. In her book she repeated only what she remembered hearing as a 4-year-old, and never stated that she actually saw an airplane herself. “Jose” is not a Japanese name. More than likely he was half or 3/4 Chamorro – quite common on Saipan with the Spanish influence. I know you doubt the story, Les, but we simply don’t know. Perhaps Jose was considered to be Japanese enough to get close to the cremation. Or perhaps he watched it from a place where he couldn’t be seen. Who knows? You just may have something there about Mr. Tomokane being considered, “Japanese enough.” The Japanese captured Saipan in 1914, with immigration of ethnic Japanese, Koreans and Okinawans beginning about 1920. Most likely, Mr. Tomokane was one of these early immigrants. He was also a teacher which, along with his ethnicity would have given him a higher status in the community as well as with the local Japanese authorities. He may very well have been tapped by them to witness the cremation to properly fulfill some legal or bureaucratic requirement. But, like you say, who knows? Mike, you have convinced me that Jose Tomokane was not Chamorro. However, I am “skeptical” of his account as told to relatives. The remains unearthed by Kothera all showed evidence of burning – except for one bone. From his review of the bones, Baby surmised that fuel oil or gasoline had been lightly thrown over the bodies because of the nature of the burns on the bone. According to the curator at the Ohio State Archeological Museum, Baby was one of the leading forensic experts in Ohio – especially as it related to human remains being burnt. . I have no reason to doubt Baby’s opinion. 1) The dimensions of the grave site, and cemetery are identical to the recollections of Henson and Burks ; The cemetery did in fact have a wrought iron fence around it. 2) The Kothera Group saw evidence of the old wrought iron fencing; 3) Henson and Burks said the grave site was near the outside perimeter of the cemetery and was close to a strange forked Breadfruit tree; 4) Henson and Burks dug to about three to four feet (they described it in a variety of ways: climbing out of it, above knee level etc.,) 5) Henson and Burks describe traveling by jeep to the location which fits the present location of the old Liyang Cemetery, 6) The cemetery fits the location described by Goerner who later confused the Liyang Cemetery with another small cemetery close to the Garapan Jail and old Japanese hospital, 7) The cemetery is definitely the same cemetery described by Devine who took a picture of the large cross still in the abandoned Liyang Cemetery, 8) Goerner’s conversations with Henson and Burks describe the same scenario of the cemetery, Goerner’s pictures are that of the Liyang Cemetery. 9) Henson and Burks, and Devine all describe a berm adjacent and to the cemetery, the old rail line, and its location not from the beach – all of this fits the Liyang Cemetery. 10) The Kothera Group found an identical dying Breadfruit tree near the perimeter of the cemetery, 11) The Kothera Group found a grave site identified by Anna about 15 feet from the breadfruit tree outside the perimeter of the cemetery, 12) The Kothera Group followed Anna’s advice and paced off ten paces from the breadfruit tree and in that immediate vicinity found the same type of firebricks brought home as a souvenir by Henson 13) The Kothera Group dug to about there feet and began finding human bone fragments but never a complete skeleton. That is consistent with the major skeletal remains having been previously removed 14) Marty Fiorillo, a member of the Kothera Group had been on previous professional archeological excavations and said he knew almost immediately when they began digging the site had been previously unearthed. (Burks and Henson in July 1944) 13) Vincent Mroz’s letter to Devine told of a cemetery where the remains of a Navy pilot’s body was being exhumed and a member of that party pointed next to where the Navy pilot’s body was and said, “That is where Amelia Earhart is buried” This site was described in a Army JAG report as being immediately outside the NE corner of a native cemetery. 14) After my three recent trips to Saipan and spending at least 120 hundred hours at the old Liyang Cemetery, I have determined from Kothera’s photographs and film, and from finding remnants of the Kothera dig, that the Earhart/Noonan grave location is 15 feet outside the NE corner of Liyang Cemetery. That corresponds with the location described in the unearthing of the Navy pilot’s remains. More importantly, it corresponds with the date of the Burks and Henson grave digging detail. . By the way, there is an old crematorium almost completely buried outside the Liyang Cemetery about 30 to 35 feet from the Kothera grave site. I hear you, Les, and don’t disagree with anything you’ve written. Thanks for your lengthy explanation, even adding some additional details to what I have in Truth at Last. Still, I believe the unbiased writer must present all realistic sides of a scenario or question. Thus readers here are never subjected to TIGHAR’s absurd, establishment-approved propaganda, for example, or ridiculous arguments for the crashed-and-sank canard. You yourself agreed in your earlier message that “we just don’t know all the facts about AE’s death.” It’s my responsibility to present what others have said and claimed. What I think or believe is of very little if any consequence, and I wrote TAL in the same way, leaving out my opinions except where clearly stating them in the beginning and end of the book. I too think Anna Magofna’s account is credible and worthy, but it’s not absolutely definitive. The bone fragments found by Kothera and his group vanished upon Dr. Baby’s death, and thus we can never know what modern DNA analysis would have revealed. The manner of Amelia’s death remains a true mystery, though not one that doesn’t suggest very likely solutions. I called Lola to clarify her grandfather Mr. Tomokane’s full name, he is a Japanese, Sadao Tomokane, His full Christian name is Jose Sadao Tomokane. You may relate this to Les Kinney. After reading Mike’s book a few years ago I got really obsessed with this tragic cover up to the point that i think I read 10 books in 3 or 4 months including one that was hard to find only concerning the radio in AE’s Electra. I had to step away because of pretty serious personal health issue at the time and the fact that the frustration was consuming me. After trying to put the Saipan “theory” into the AE Wikipedia listing with at least some semblance of balance and a respect for the facts and having it blocked (by TIGHAR cronies?) I really was angry. I had to back away. I was also driving Mike crazy with correspondences I think believe. Watching the BS in the popular press over the years also ate me up. This blog pulls me back all the time though. Thanks Mike. I only wish to go to know the full truth before I go to the grave. I know many of you are true historians of this story; keepers of the fire of truth. Thank you. Thank you, Charlie, for your diligence and loyalty to the truth. What a nice message, sent straight from the heart. If only we had about a million more like you! I should proofread a bit but you get my point. Not at all, Charlie; you’re fine. I added a period where one was needed. Other than that, no real issues. Thanks, you’re point is indeed well taken and most appreciated. I am angry about the refusal of the US and Japan to admit AE died in the custody of Imperial Japanese forces. Keep up the good work!